Usually, cheating is bad for everyone. It erodes the fabric of society. It’s unfair to those who play fair. And it robs you of growth and learning. But there’s a socially acceptable form of “cheating” that allows everyone to win. What’s funny is that, when presented with this opportunity to cheat, most folks dismiss the opportunity they’ve been given. In defense of the naysayers … hey, it only teaches you 3 things. That’s it. See, you get to do an ethical-cheat by taking advantage of the decades of research that went into this book. If you’ve ever had to tell an employee they need to improve their performance, you’ll know the consequences of getting this wrong can be quite dire. The cost can range from hurt feelings … to the loss of office harmony … all the way up to a lawsuit. 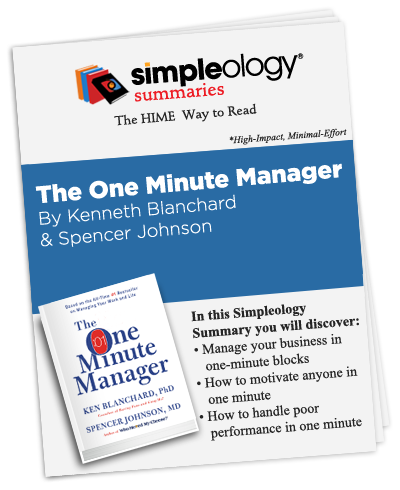 Wouldn’t it be worth taking 5 minutes to read our fun cartoon summary of The One Minute Manager and learn these three things in the fastest way known to man?